I have not crocheted in years. After talking to Pam from Scrap N Sew Granny and her telling me she had bought a Knitting Loom and that she had made a scarf (see it here). It inspired me to pull our my crocheting stuff and make something. 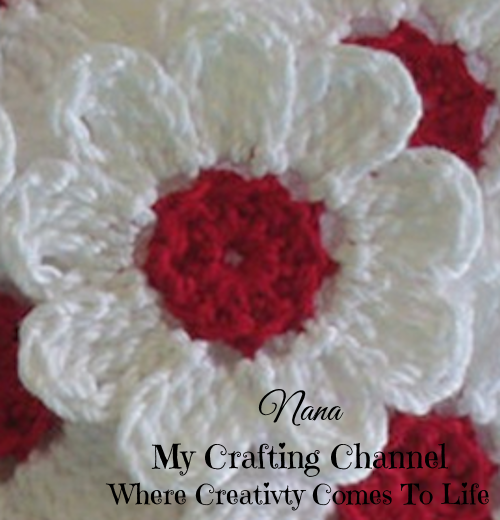 This past weekend I made these flowers and also a couple scarfs that I will I will post this week. It feels so good to start back doing some other crafts. I did go and buy the knitting looms and hope to give them a try in the very near future. I think they are adorable what say you? These are so pretty. I like to crochet also. Mostly lacy doilies. I love to crochet. These flowers are beautiful. Time I saw them, they just made my heart smile. Stuff like this is priceless. Love love love. These flowers are soo beautiful!! LOVE them!! Have a great day. GORGEOUS flower! I haven't crocheted in years:) thanks for inspiring! Oh wow Nana your flowers are so pretty. I am useless at crochet I think it has something to do with me being left handed. I can knit fine as I learnt to do this right handed but find crochet to hard to control the hook and yarn together lol. These flowers are so pretty! It has been a while since I crocheted...but your flowers have me wanting to go find my crochet hooks...Thanks for sharing! I love your beautiful flowers. It has been awhile since I crocheted also but I love your flowers, would you mind sharing the instructions. How to video is in the recipe above.